Nal Sarovar is a Bird Sanctuary, spread over 120.82-sq-km Lake with shallow waters and muddy marshlands, is situated about 60 km from Ahmedabad near Sanand Village, in Gujarat. 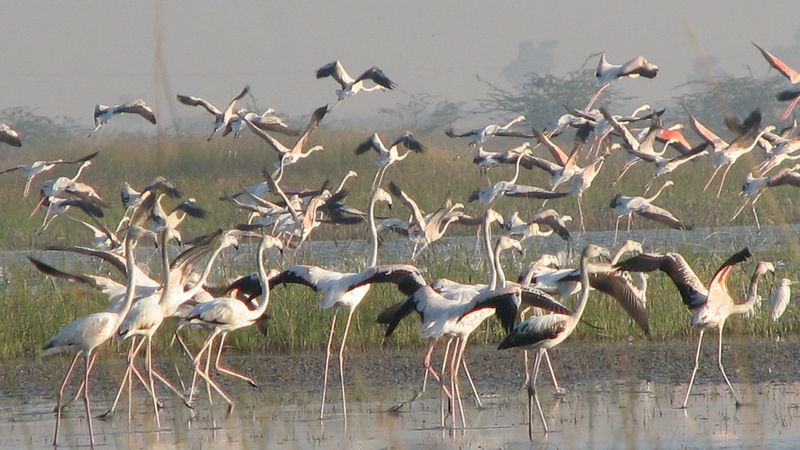 Mainly inhabited by migratory birds as wintering ground, it is the largest wetland bird sanctuary in Gujarat, and one of the largest in India. Nalsarovar near Sanand was declared a bird sanctuary in April 1969. Nalsarovar still awaits Eco-sensitive zone distinction. More than 200 types of birds mainly waterfowl inhabit Nalsarovar sanctuary and come from as far as Siberia. Nalsarovar wetland among 26 wetlands in the India to be internationally recognized as ‘Ramsar’ site but is still waits for its distinction of Eco-sensitive zone. In absence of the ESZ many holiday homes & housing projects are coming up around the lake, it is on the side towards Ahmedabad where most of the development is taking place. Nalsarovar being close to Ahmedabad, several plotting schemes have come up in the area and the forest department cannot do anything about it until the Eco-sensitive zone distinction is in play.